You didn't mention anything about blowing up China. They are a huge consumer of oil. It's important to remember that this is a global problem. Do you really think if we took the oil company profits away from them, they would want to increase the supply in the U.S.? Or would they instead want to sell the oil elsewhere in the world where they could make more profit? a) Take away profits from oil companies: remove incentive for them to try to expand the supply. (Depending on how they want to expand the supply of oil, this could be a good thing or a bad thing.) 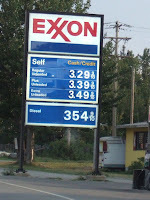 This seems likely to increase the cost of gasoline, also. b) Eliminate taxes on gas sales: make some consumers feel good, help people keep driving as much as they used to, and take away billions of dollars of revenue from a government already drowning in debt. c) Do as Europe and tax the heck out of gasoline: artificially accelerate the transition to alternative technologies, increase gov't revenues, make people really mad and don't get elected in November. d) Let the market do its thing: continue the transition away from oil that has already begun, maintain current revenues for government, tick people off by your inaction and don't get elected in November, unless you're an incumbent congressman or a Democrat. I support c) or d) but those are obviously the politically infeasible solutions. Oh well, the power of oil prices is a steam train that will crush any government policies or wishful thinking trying to stand in its way -- so start using something else. Let the dead and decaying paleo-junk that is fossil fuels rest in peace! Jacob: Great point! Let's blow up China! I don't know why I didn't think of that one before! Where's my Big Red Button? As for profits, I wasn't advocating taking them away. I was making the point that taking them away wouldn't solve the problem. And the inevitable gravitation of these global companies away from the U.S. is one example of how it would fail to solve the problem. anonymous dude: From what you wrote, it seems like you don't agree with Jacob. I think he was implying that we should leave oil companies alone, and you seem to be saying that we should impose controls on them. I do share your frustration with the current political system, though. It's too bad that it's so difficult for anyone who's not a mainstream Democrat or Republican to get elected. An instant-runoff voting system would make candidates from smaller parties viable, but guess who makes the election laws? Josh: Thanks for the thoughtful (as usual) response. I agree with you on options c) and d). It's a shame that The Man has so much control that those options aren't politically viable, although I suspect that option d) will win out in the end. The invisible hand is a very persistent opponent, and eventually it won't be worth fighting it anymore. I just hope we're not up a creek without a paddle at that point.